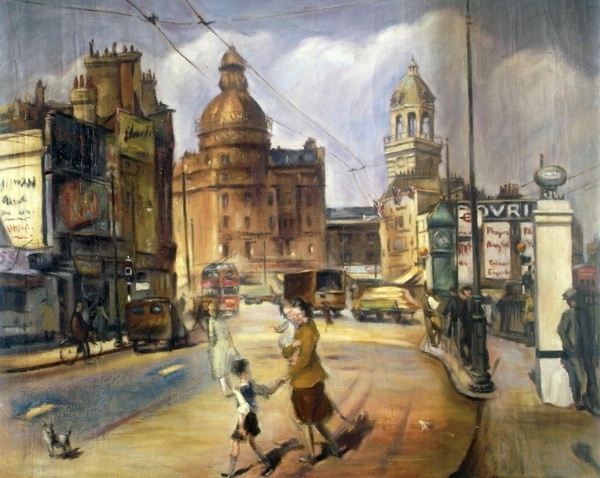 After serving as a Gunner in the Royal Artillery in World War II, Cyril Mann returned to live in a tiny flat in Paul St with his wife Mary and small daughter Sylvia in 1946. Close to where the Barbican stands today, this area at the boundary of the City of London had suffered drastic bomb damage and much of it remained a wasteland for decades. 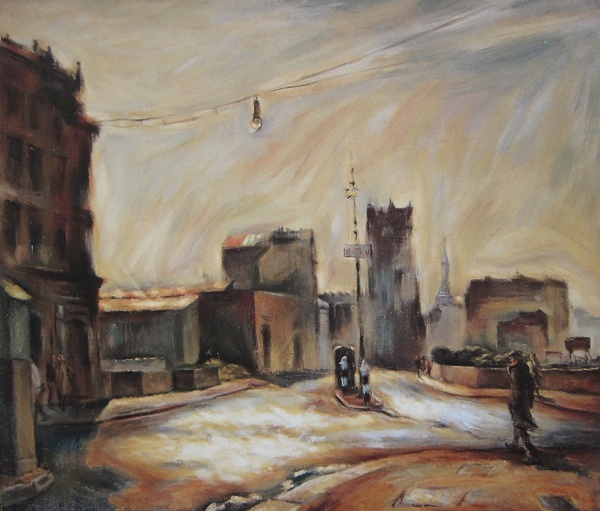 Roving around these desolate streets as far east as Spitalfields, Cyril Mann discovered the subject matter for a body of works which became the focus of a major exhibition at the Wildenstein Gallery in 1948. Losing his hair in his thirties, Cyril Mann had the look of a man older than his years. 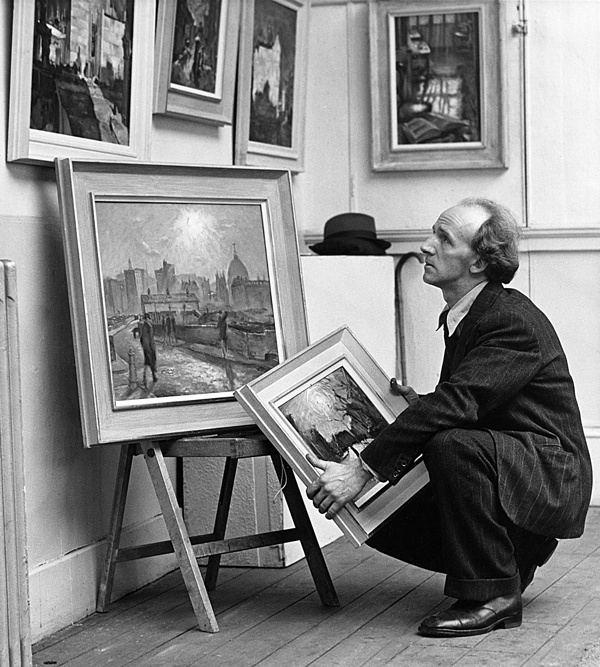 Through the Depression he had been unemployed and close to starvation, yet thanks to a trust fund set up by Erica Marx he entered the Royal Academy Schools at twenty years old in 1931. For one so young, he had already seen a great deal of life. 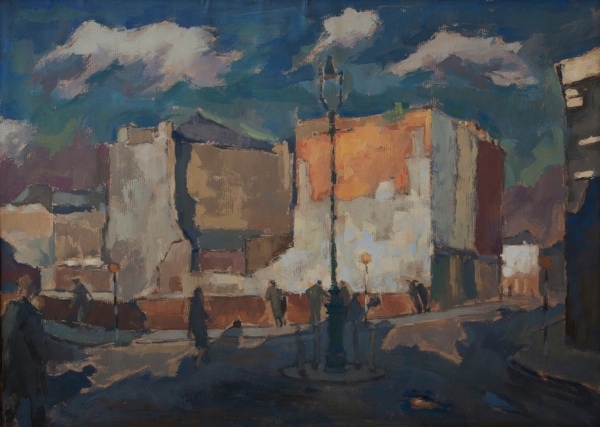 At twelve, he had been the youngest boy ever to win a scholarship to Nottingham College of Art, before leaving at fifteen to be a missionary in Canada. 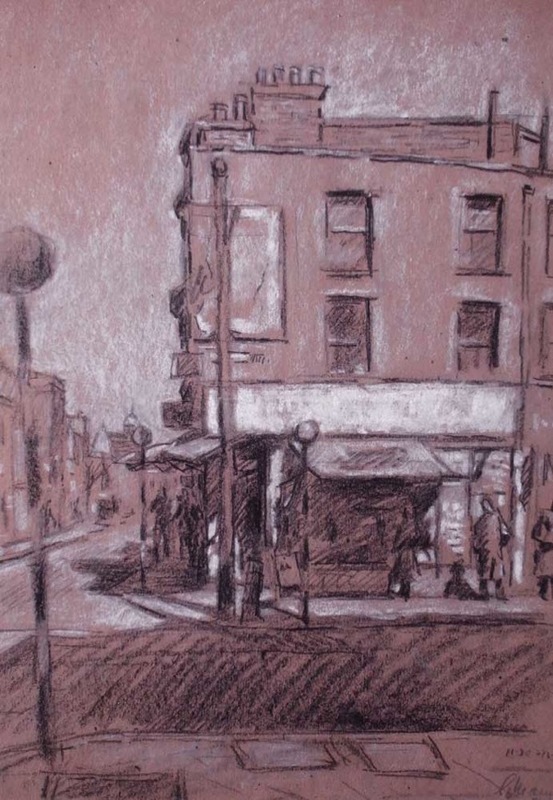 Quickly abandoning this ambition, he became a logger, a miner and a printer, until returning to London to renew his pursuit of a career as an artist. Ever restless, he moved to Paris after three years at the Royal Academy and there he met his first wife Mary Jervis Read. 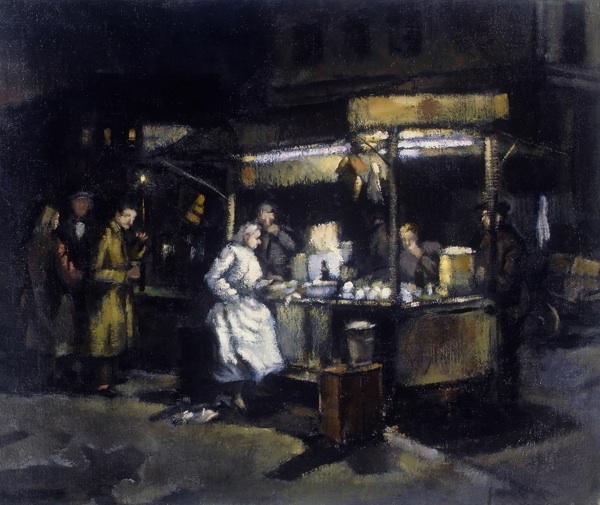 Forced to leave his wife and baby when he was called up in 194o, Cyril Mann did not paint at all for the duration of the war. Back in London and battling ill-health, he set out to make up for lost time. 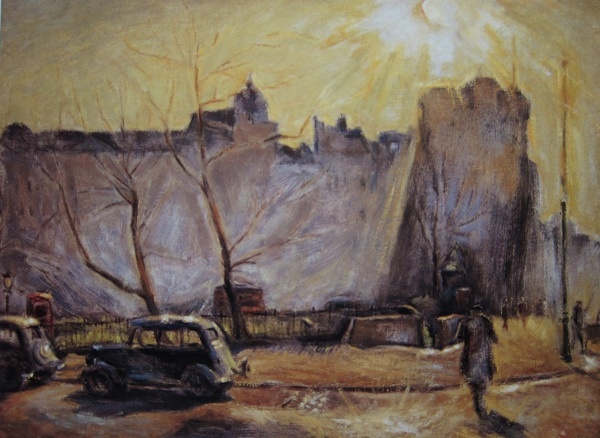 The fragmented urban landscape of bombsites that was familiar to Londoners was new to him and, turning his gaze directly into the sun, he sought to paint it transfigured by light. 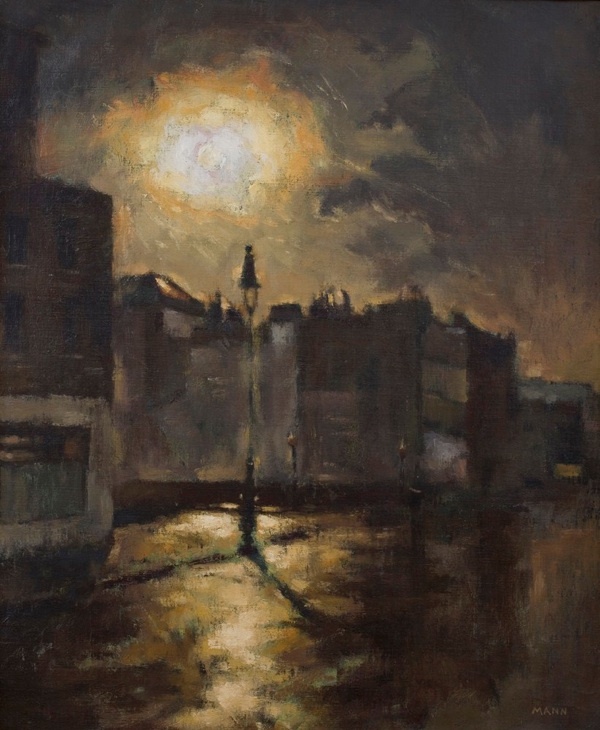 Channelling his turbulent emotion into these works, Cyril Mann strove to discover an equilibrium in the disparate broken elements he saw before him, and many of these paintings are almost monochromatic, as if the light is dissolving the forms into a mirage. During these years, Cyril Mann’s life underwent dramatic change. 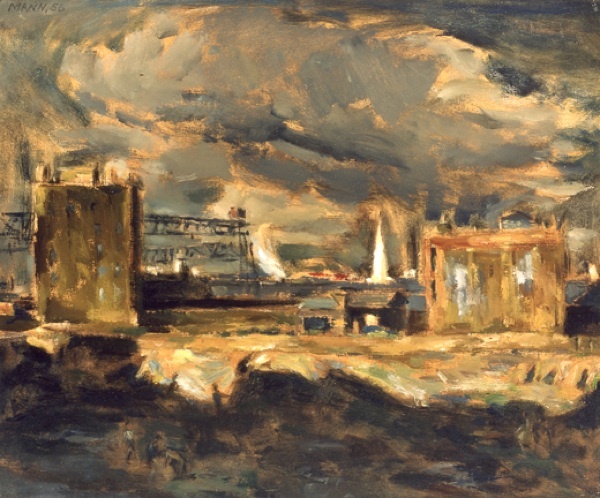 He obtained a teaching job at the Central School of Art in 1947 and exhibited at the prestigious Wildenstein Galery, showing his new works in 1948. 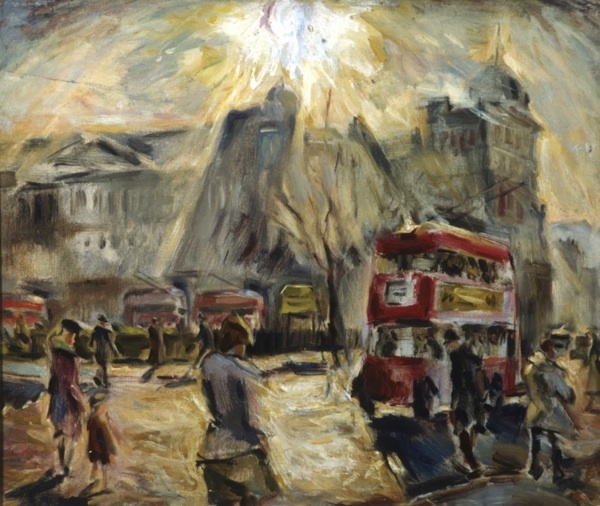 Yet at the same time, his marriage broke down and he found himself alone, painting in the tiny flat in Paul St. Whilst critically acclaimed, his exhibition was a commercial failure because, in post-war London, nobody wanted to see images of bombsites and consequently these important works became forgotten. 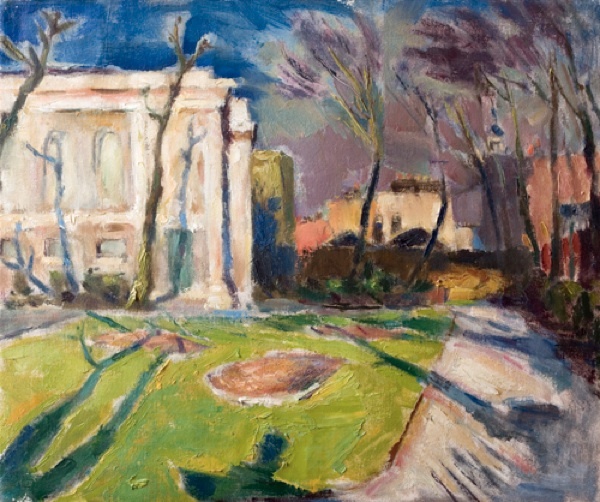 Yet, through his struggle, Cyril Mann’s work as an artist had acquired a new momentum and, after 1950, a bold use of colour returned to his painting. In 1956, he was offered a flat in the newly-built modernist Bevin Court built by Tecton in Islington, where today a plaque commemorates him. 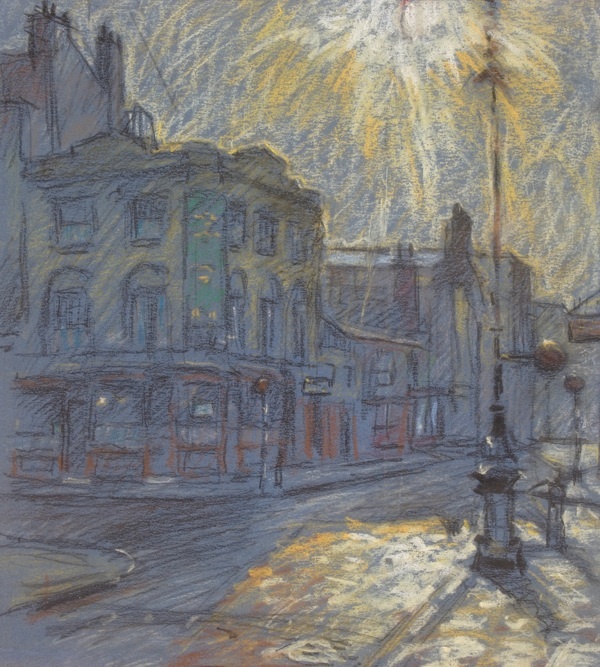 In 1964, he moved east to Leyton and then Walthamstow,where he died in 1980.
the sun shining through the fog, and all the sky effects, brilliant. i imagine this to be the london martha quest makes her extraordinary long walkabout in, in lessing’s The Four-Gated City. such an important landscape, for so many reasons. there’s a long german word for it, i think. Beautiful pictures, I would have them on my walls. Strong touch of Post Impressionist, Stanley Spencer and Paul Nash altogether. 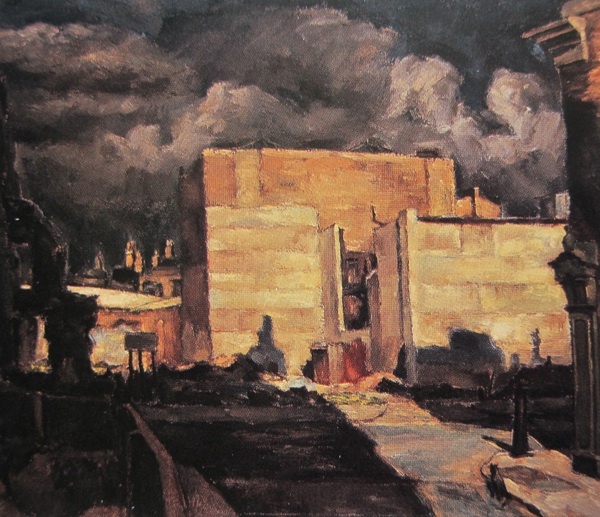 He had the foresight to paint pictures of depressing buildings that weren’t appreciated then and very brave too. 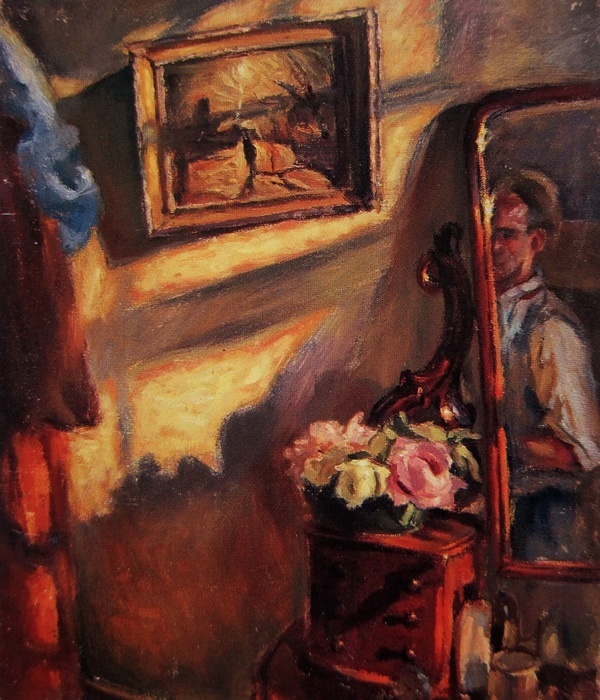 Paintings of those depressing years are very much appreciated today. These are wonderful, so full of light and life. Never seen them before. Thank you – a lovely way to start my morning. Sincere thanks for bringing this terrific man’s work to my attention. I am speechless … such incredible paintings. The skies and the self-portrait especially are so compelling. Thank you for sharing this man’s art. It made my week and inspired my work. 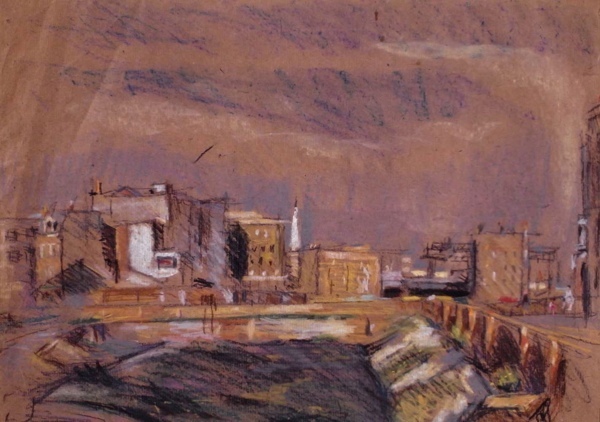 A very atmospheric view on the London postwar period — beneficial the fact that he did NOT paint in the modern abstract style…! 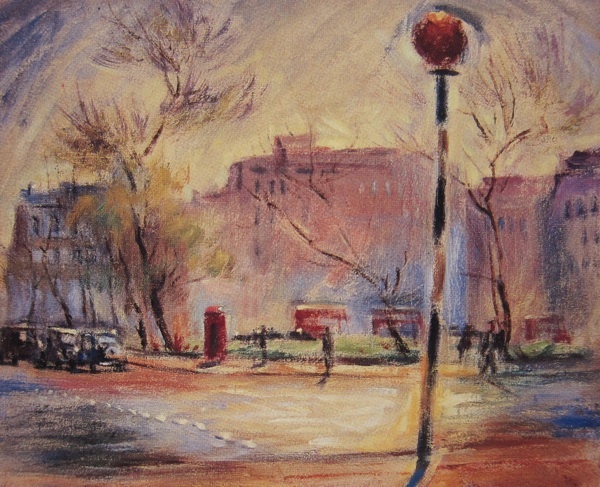 Beautiful pictures and so nostalgic – when returning to London from evacuation this WAS my London. 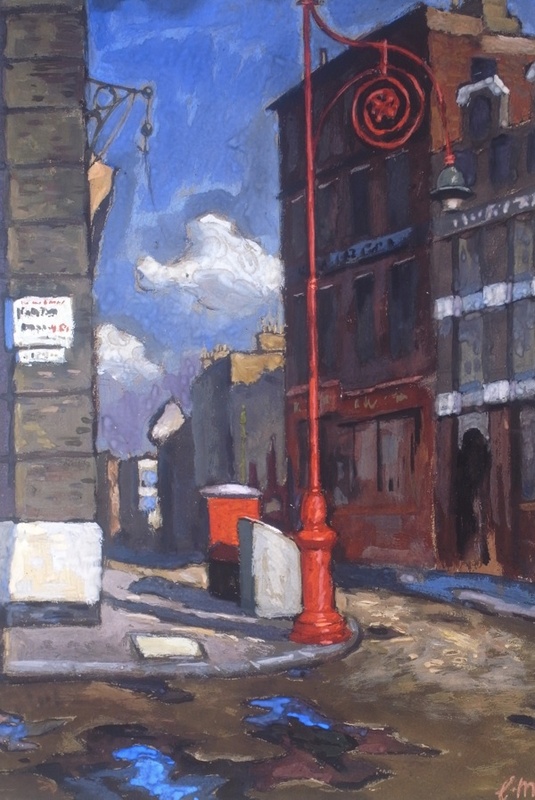 My favourite is the wonderful red lamppost at Old Street. Frustrating not to be able to see the name of the street on the nameplate so it would be hard to check and see if it is still there, but I somehow feel it will have been long ago replaced by an ugly modern one. very nostalgic and the angel city road is amazing it takes me back to when i travelled on a tram up city road with my parents. many thanks for posting. 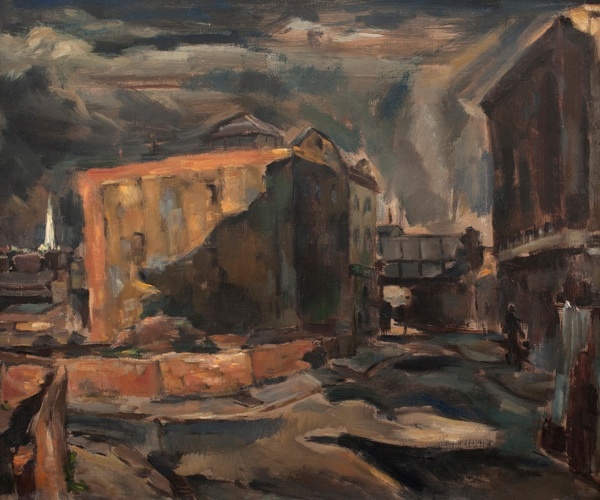 Even as a boy and later on, I often thought that one of the most difficult things to depict, describe or paint was, and is, a bomb site, or a debris. Simply put, there are so many separate items and objects on the site which are arranged anarchically. How does one show this devastation? Few artist, as far as I know, have even attempted this. 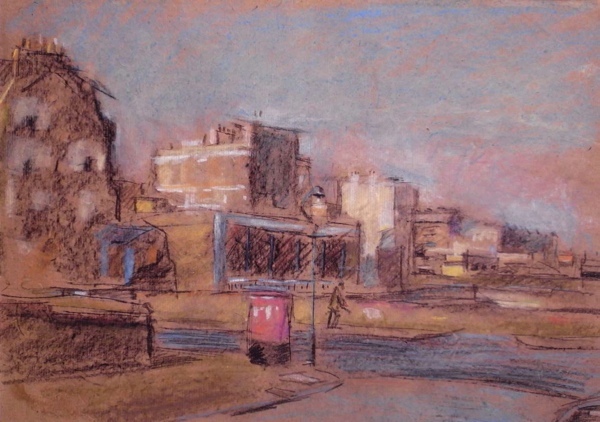 This artist has clearly shown that the years after WW two, debris was a significant part of the inner London landscape. 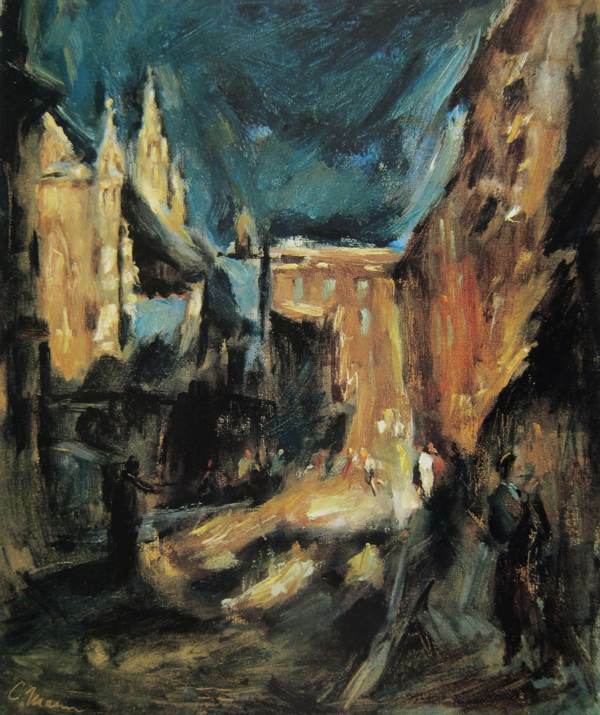 Radiantly beautiful paintings of what many would see as depressing and sad townscapes – but I would love to have them on my walls. A revelation. I’d never come across this artist before. Incredibly atmospheric paintings of a now lost world and time. 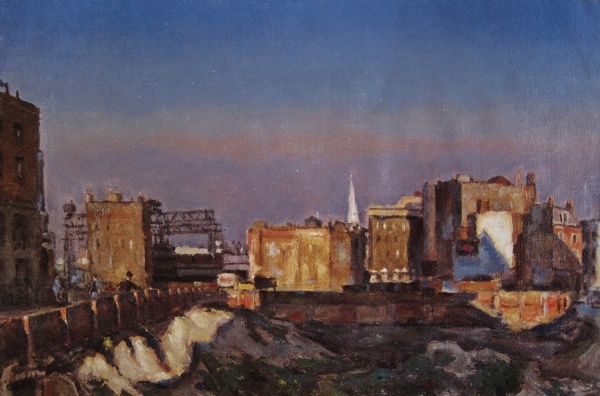 Shades of Edward Hopper as well. 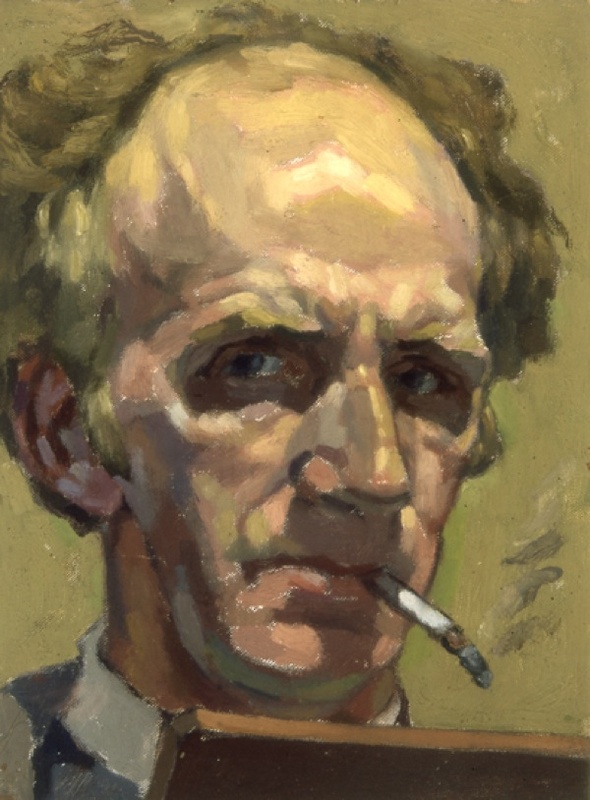 I have seen quite a few of Cyril’s later paintings, indeed one of them hung in the Student’s Union office at Keele Uni when I was there – but since vanished who knows where. 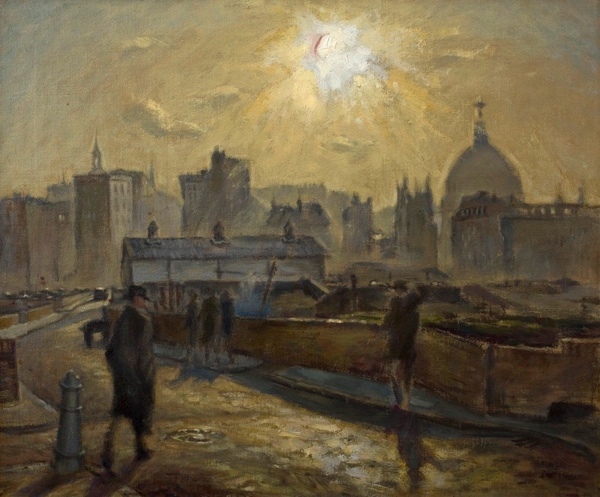 These earlier pictures are fascinating, in some of the oils in particular, the light seems to occupy the paintings as a living entity, as if it were separate from the painted representations of sun and lamp, and is tangible, moving around buildings and shadows almost like the air on a windy day. It is terrific that they are available for many more people to see than he could ever have imagined; thanks in a large part to Renske.